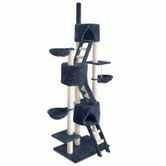 Combining scratching, perching and climbing, our cat tree is every cat's dream haven. Have them enjoy hours of entertainment and a comfortable resting place on the soft plush covered platforms. With such multiple spots for chilling and climbing, they can share it with other buddies or have it all for themselves. An absolute paradise for every cat.